Roy Beggs MLA (election agent), Lindsay Millar and Andrew Wilson. 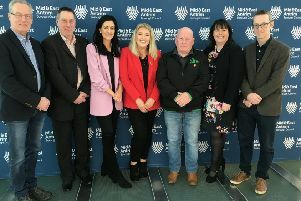 The Ulster Unionist Party has announced that sitting councillors Lindsay Millar and Andrew Wilson have been nominated to defend their seats in Knockagh. Cllr. Lindsay Millar is the current mayor of Mid and East Antrim with running mate cllr. Wilson topping the poll at the last local government election in the ward. Cllr. Millar said: ““We are at a point in time when confidence in elected representatives is at an all time low. Unfortunately, the failure of the two largest parties to establish a devolved Executive at Stormont has led to a whole new level of apathy. “Local government is the most accountable form of government, and is currently the last bastion of democracy in Northern Ireland. That is why it is so important to vote for people you trust to represent you in council. “When local councils were reformed in 2014, the Ulster Unionist Party wanted further powers devolved, and this is still the case. “I want the regeneration powers that were promised to local government and never delivered; I want council to have responsibility for important matters like gritting roads and filling potholes, but most importantly, I want people to have trust in those they have elected to represent them. “At local government level, it is so important that elected representatives are held accountable for how the ratepayers’ money is being spent, and I am proud of my record of scrutiny on this. Cllr. Wilson added: “It has been an honour to represent Knockagh for two terms. I live in the local area and have served as a Boys’ Brigade officer for 13 years at my church, Carrickfergus Methodist. “I serve on Central and Woodburn Primary School governors and was appointed by the community to serve as Greenisland Regeneration Group chairman. “I have a record of delivery for the local community on important projects. In my role as a school governor at Woodburn Primary School, I secured a visit from the then Education Minister to see at first-hand the need for a new school at Woodburn. Thankfully, we successfully secured the funding for a new build, with work progressing well. “In the Greenisland area, I chair the regeneration group which is made up of community representatives from the churches, sport clubs, businesses and community groups. Through engagement with council and Greenisland FC over a number of years, we successfully secured substantial funding for a 3G sports pitch for the community, adding to Sport NI funding that the football club secured.